The mathematical works of Manuel Valdivia (J. Horváth). Regularity properties of (LF)-spaces (D. Vogt). Some applications of a decomposition method (A. Aytuna, T. Terzio&gbreve;lu). On the range of the Borel map for classes of non-quasianalytic functions (J. Bonet, R. Meise, B.A. Taylor). Biduality in Fréchet and (LB)-spaces (K.D. Bierstedt, J. Bonet). Holomorphic mappings of bounded type on (DF)-spaces (P. Galindo, D. García, M. Maestre). Linearization of holomorphic mappings of bounded type (J. Mujica). Spaces of holomorphic functions and germs on quotients (J.M. Ansemil, R.M. Aron, S. Ponte). Automatic continuity of intertwiners in topological vector spaces (K.B. Laursen). Barrelled function spaces (L. Drewnowski, M. Florencio, P.J. Paúl). On distinguished Fréchet spaces (J. Bonet, S. Dierolf). Prequojections and their duals (G. Metafune, V.B. Moscatelli). Problems from the Pérez Carreras/Bonet book (S.A. Saxon). Interior properties and fixed points of certain discontinuous operators (W.R. Derrick, L. Nova G.). Functional analytic aspects of geometry. Linear extending of metrics and related problems (C. Bessaga). Lotosky-Schnabl operators on the unit interval and degenerate diffusion equations (F. Altomare). On weakly Lindelöf Banach spaces (J. Orihuela). Distinguished subsets in vector sequence spaces (F. Bombal). Weak topologies on bounded sets of a Banach space. Associated function spaces (J.G. Llavona). Factorization of multilinear operators (J. Taskinen). Complex geodesics on convex domains (S. Dineen, R.M. Timoney). Continuity of tensor product operators between spaces of Bochner integrable functions (A. Defant, K. Floret). Compact convex sets in the two-dimensional complex linear space with the Yost property (E. Behrends). Some remarks on a limit class of approximation ideals (F. Cobos, T. Kühn). Some factorization properties of composition operators (H. Jarchow). Eigenvalues of nuclear operators on Tsirelson spaces (A. Pietsch). Absolutely summing surjections from Sobolev spaces in the uniform norm (A. Pelczy&nacute;ski, M. Wojciechowski). This volume includes a collection of research articles in Functional Analysis, celebrating the occasion of Manuel Valdivia's sixtieth birthday. 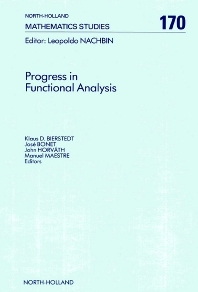 The papers included in the volume are based on the main lectures presented during the international functional analysis meeting held in Peñíscola (Valencia, Spain) in October 1990. During his career, Valdivia has made contributions to a wide variety of areas of Functional Analysis and his work has had a profound impact. A thorough appreciation of Valdivia's work is presented in J. Horváth's article. In honor of Valdivia's achievements, this volume presents more than twenty-five papers on topics related to his research (Banach spaces, operator ideals, tensor products, Fréchet, (DF) and (LF) spaces, distribution theory, infinite holomorphy etc.). While the majority of papers are research articles, survey articles are also included. The book covers a broad spectrum of interests in today's Functional Analysis and presents new results by leading specialists in the field.